Stephen & Ana met at Southern Illinois University Carbondale, while away at school. Ana, originally from Champaign area, went to SIUC for her two bachelor degrees, one is Spanish, and in Social Work. She went on to get her masters in Social Work. Stephen, originally from Marion, went to SIUC for his bachelors degree in Speech Communication, with a specialization in Public Relations. When Anna was 14 years old, God placed a desire in her heart to become a missionary, even before going on her first mission trip. 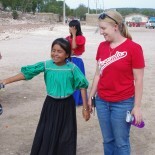 After her first trip to Mexico in December of her freshman year in high school, she felt God leading her to start in Mexico. When Stephen was 14, his dad suggested studying Spanish, based on the growing Latino population in the states. Before Stephen’s first mission trip to Mexico, someone prayed over him that this would be the first of many mission trips as a missionary. This dream has continued to grow through the years, with many trips to Mexico in preparation. Now we are excited to finally take the next step and move to Zacatecas, Mexico.